I am a cloud fanatic, as you have probably already figured out. 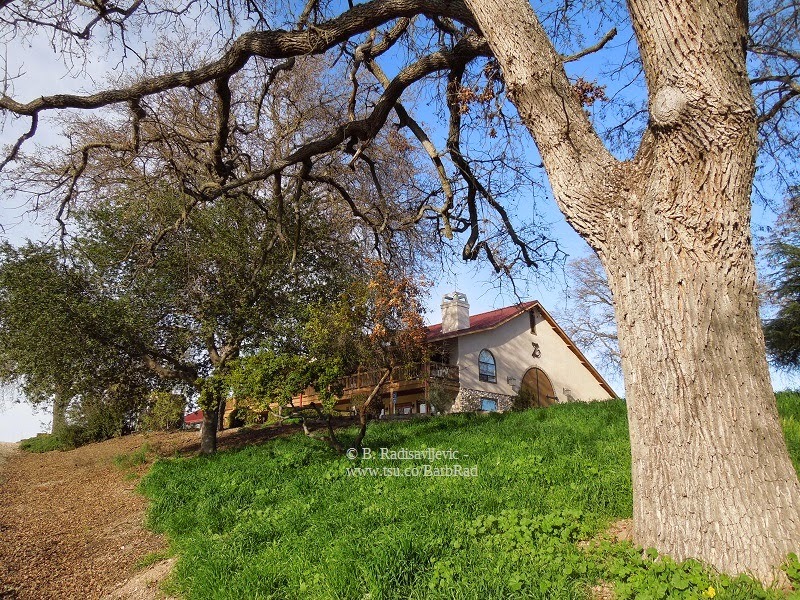 My two favorite subjects for photography are the sky and trees, especially oak trees. 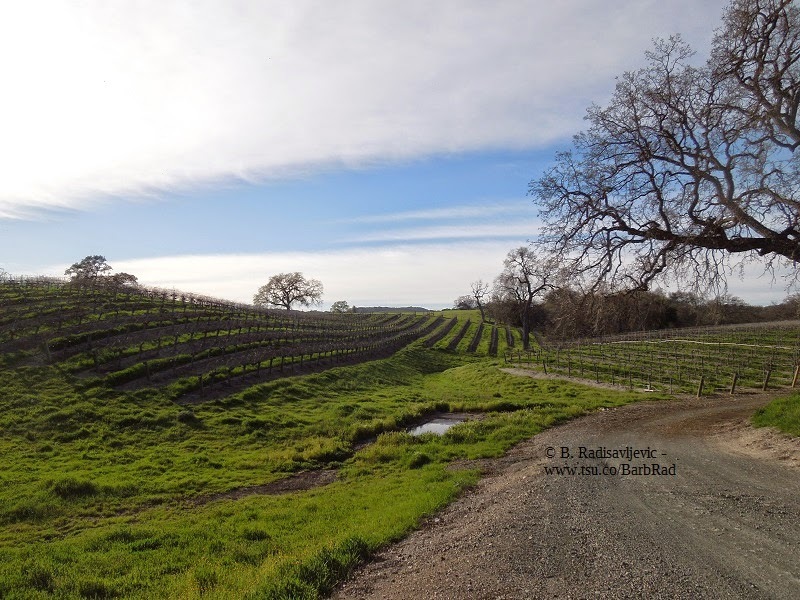 That's one reason I can often be found in the vineyards of Paso Robles and Templeton, California. 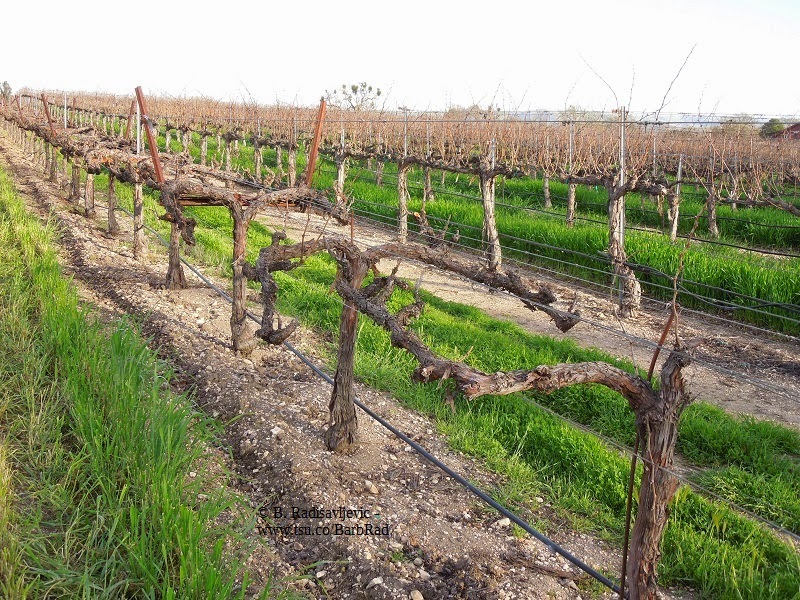 One vineyard where I spend a lot of time is Doce Robles. 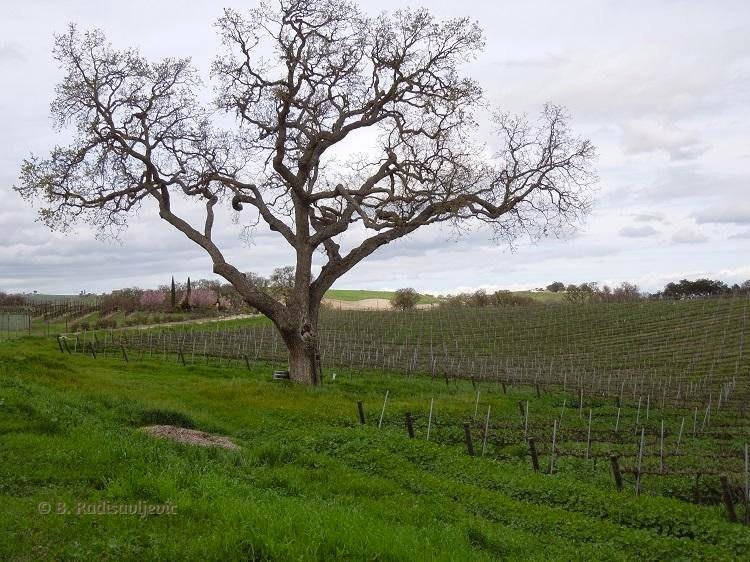 It has magnificent vineyards and some splendid oak trees. This is my favorite. You can click this photo or any other to enlarge it. The blooming trees in the background show better that way. 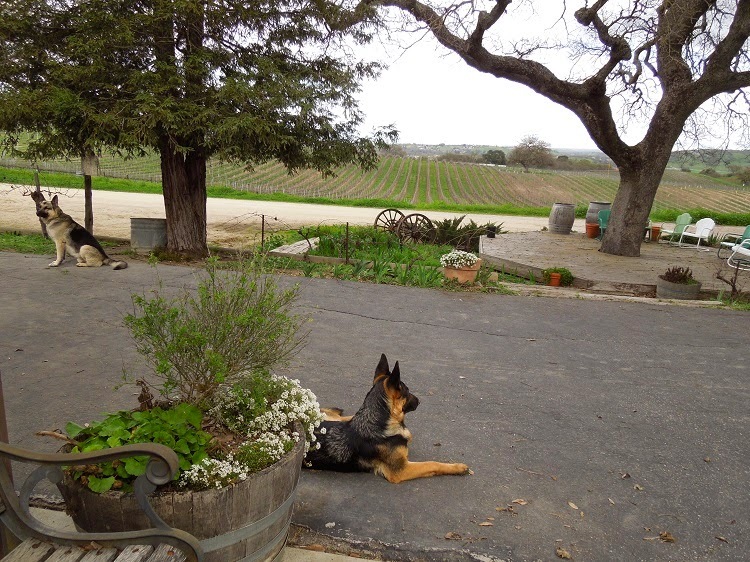 When I first got to the vineyard I was met by the dogs. They are the official greeters. But they relaxed a bit and hardly noticed when I walked past them here. 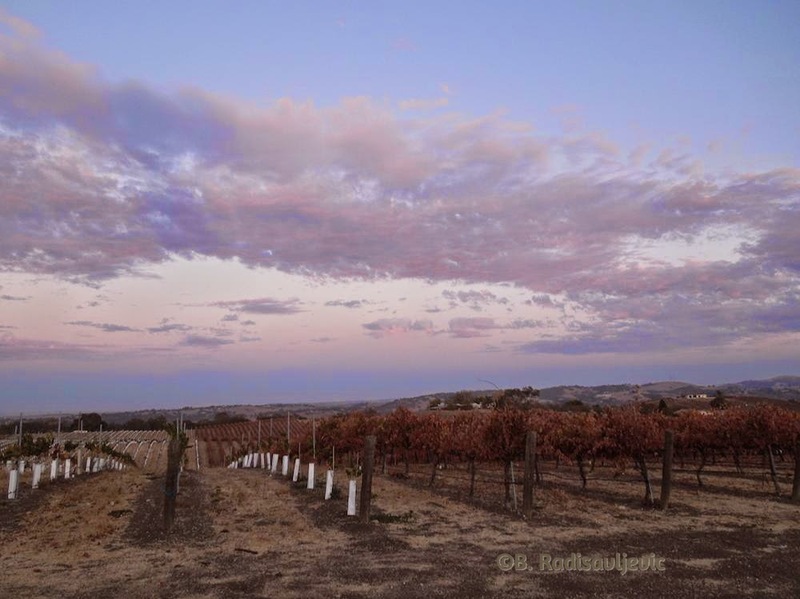 One reason I love this vineyard for photography is that there is always a clear view of the sky all the way around. The trees make wonderful frames for the sky shots, and the only obstacles are a few wires to work around. I can normally manage to avoid those. Today the clouds were dramatic. I had taken a few photos of them downtown, but I knew at Doce Robles there would not be any buildings in my way to obscure my view. 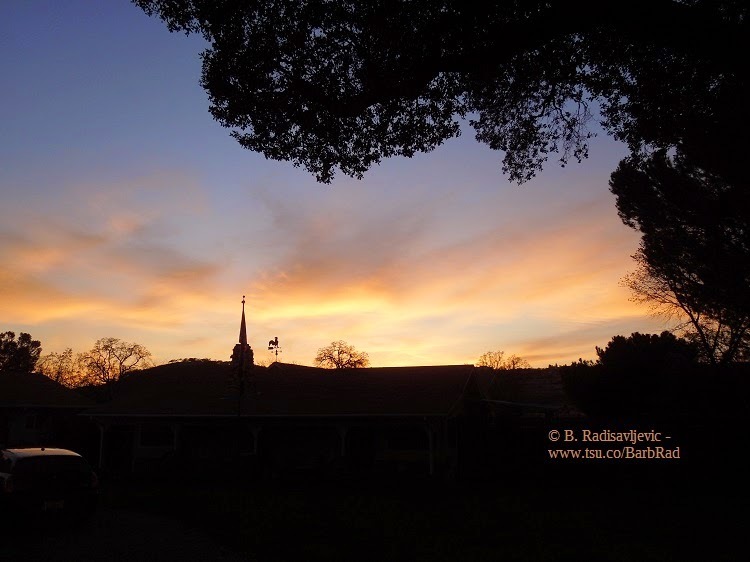 Very often I'll be driving home near sundown and see a gorgeous sunset ahead of me on 46 West and I know the sun will be gone before I get home, so I turn onto Twelve Oaks Drive and park at Doce Robles to shoot my photos before dark. That's what I did on November 10, 2013 when I saw a lovely pastel sunset ahead of me. 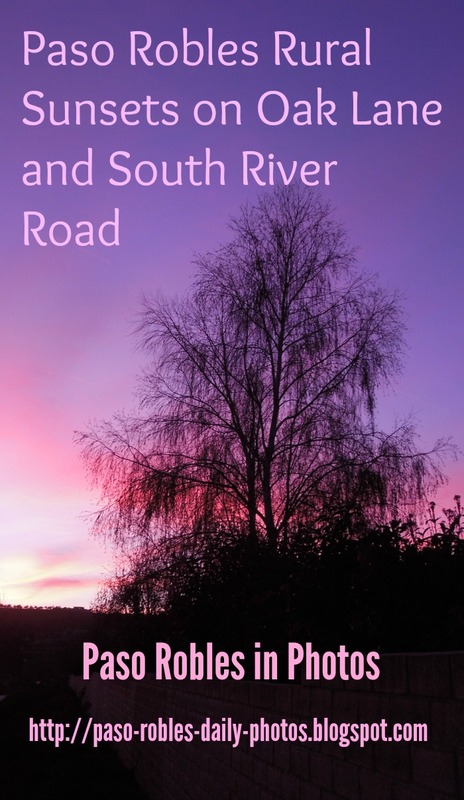 Since it was autumn, the vines were red under the pink and lavender sky. Today I could not stay until sunset, so I concentrated on the clouds. I was looking southwest. The road you see below is Highway 46 West. 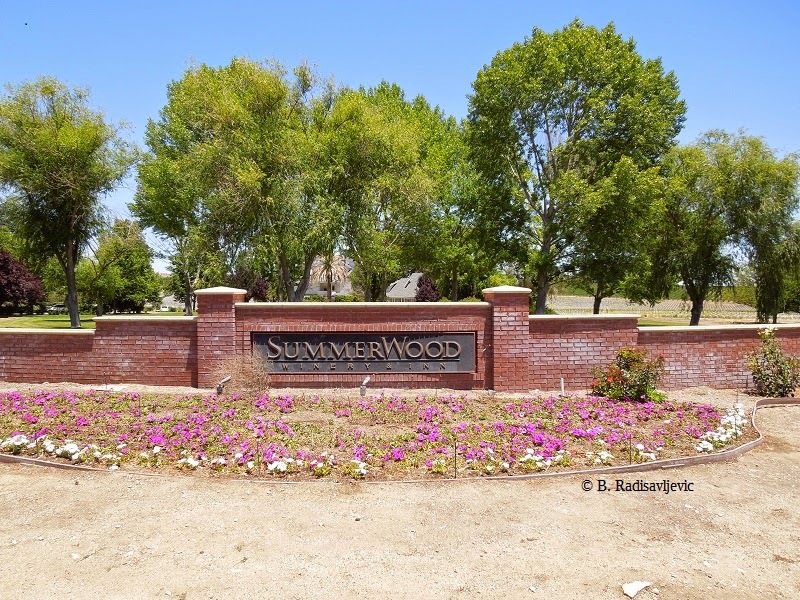 The building in the background is SummerWood's Guest Inn. 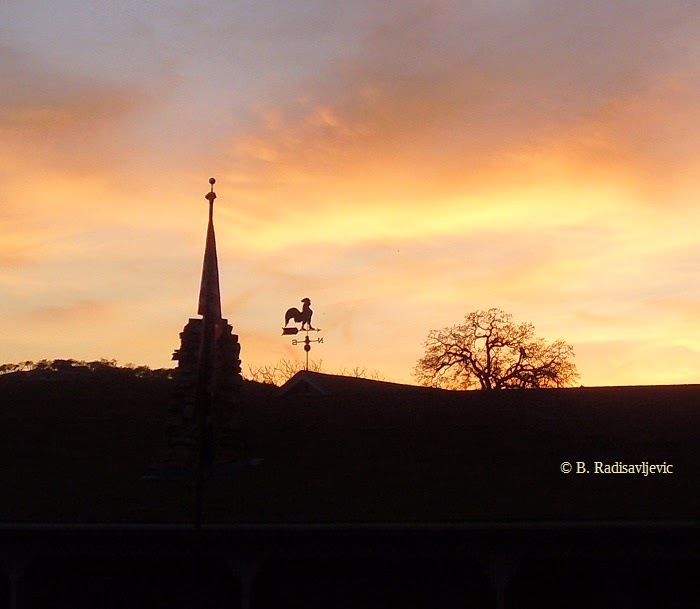 Have you ever visited the Paso Robles 46 West Wine country or Doce Robles? 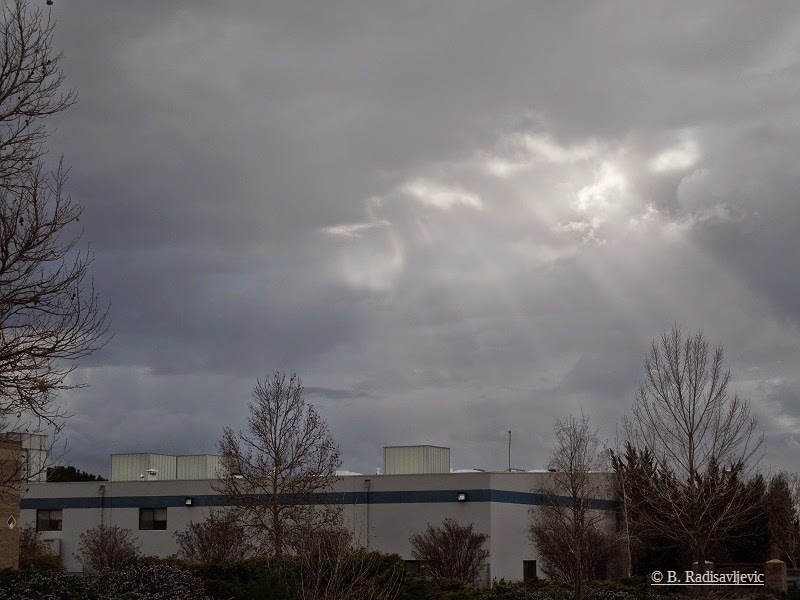 You can find more photos of today's clouds and Doce Robles here. 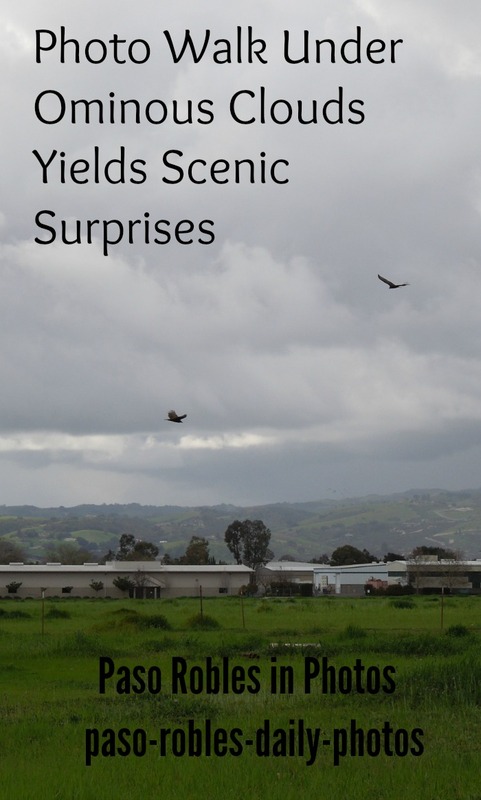 Since we've taken a lot of pictures at Doce Robles, we have a lot of Doce Robles gift items in our Zazzle store. 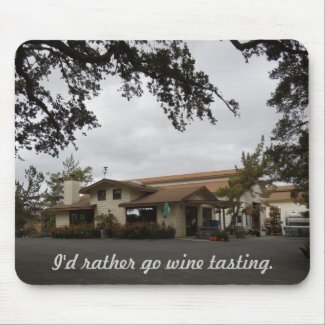 This mouse pad below features the tasting room at Doce Robles. I love rural sunsets, and I'm blessed to see a lot of beautiful ones where I live. I left on my walk today in the late afternoon while the sun was still bright, but almost to the horizon. I went back to Oak Lane, that rural area where I photographed the Pig-Up Close and Personal and The Bird on a Bridge from a Bridge. The pig came to say hello, and every dog on the street barked at me. The geese I saw also came to talk to me, although one hissed at me. But it was the sunsets I was waiting to get. Of course, I had to do something while waiting for the sun to set, so I did take some photos of the animals. The dogs were all very protective of their properties. Some sounded ferocious while wagging their tails, sending mixed messages. But this one took guarding the property very seriously and seemed to be an excellent watchdog. 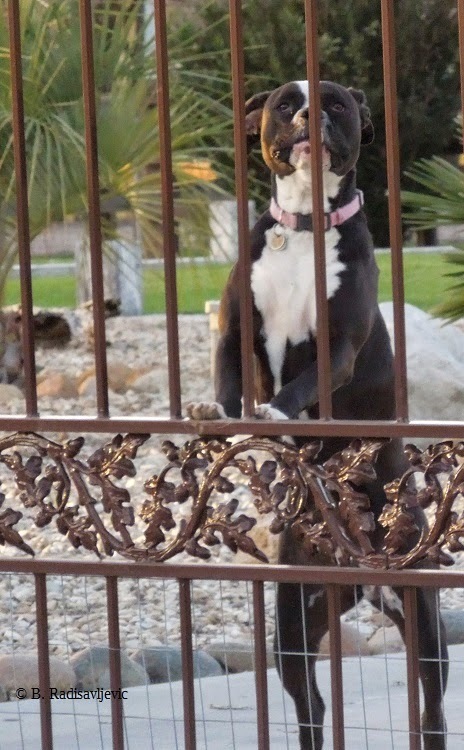 I think any burglar would think twice about trying to get over this fence. 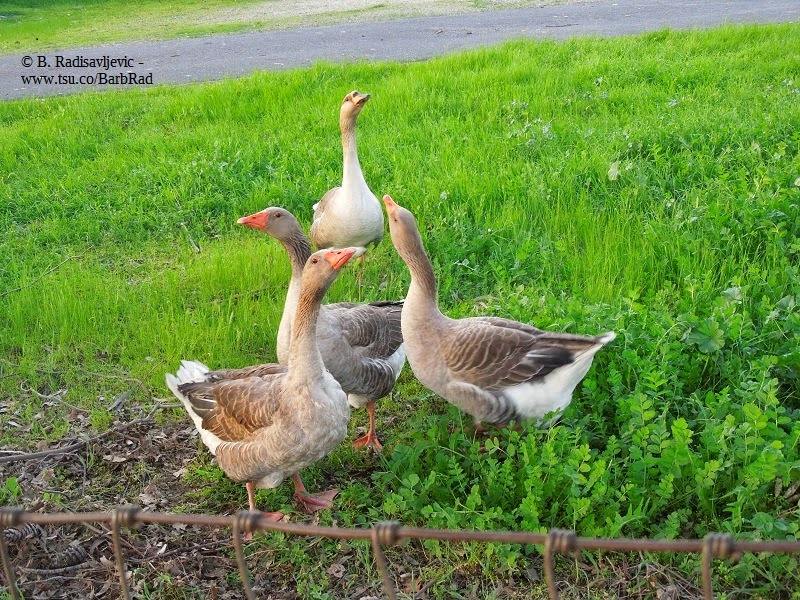 I loved watching the geese on one small farm. I even made videos of them, but haven't had time to process them yet. Geese are funny. These seemed curious enough to investigate me, but they reminded me of prim dowagers gossiping and hissing their disapproval of my observing them. What do you think? Eventually the sun started to set. This is the photo the top picture was cropped from. I took this photo on the way back to my car. 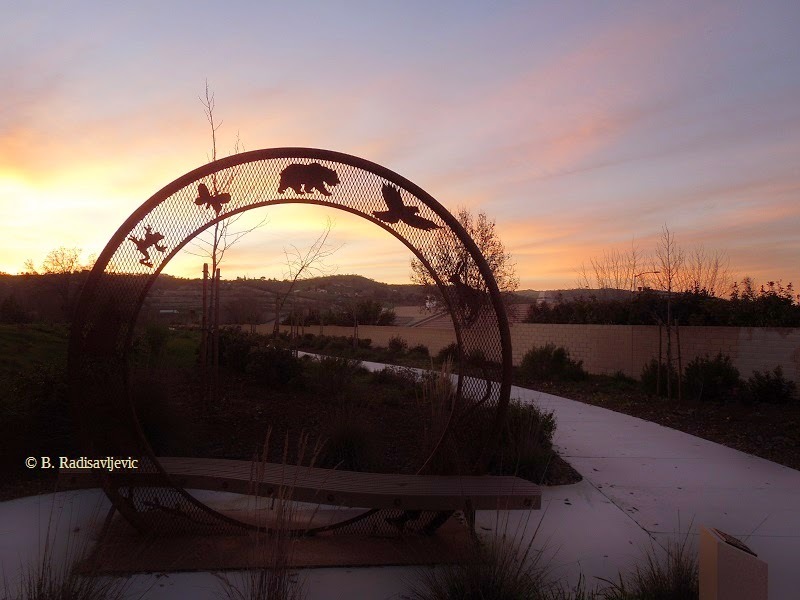 I wanted to capture the sunset behind this statue at the beginning of the Charolais River Trail that leads to Larry Moore Park and the Salinas River. This last photo, just the right size to pin was taken over the fence and captures a new phase of the disappearing sun with different colors. If you enjoyed these photos, why not share them. Sharing buttons are below. 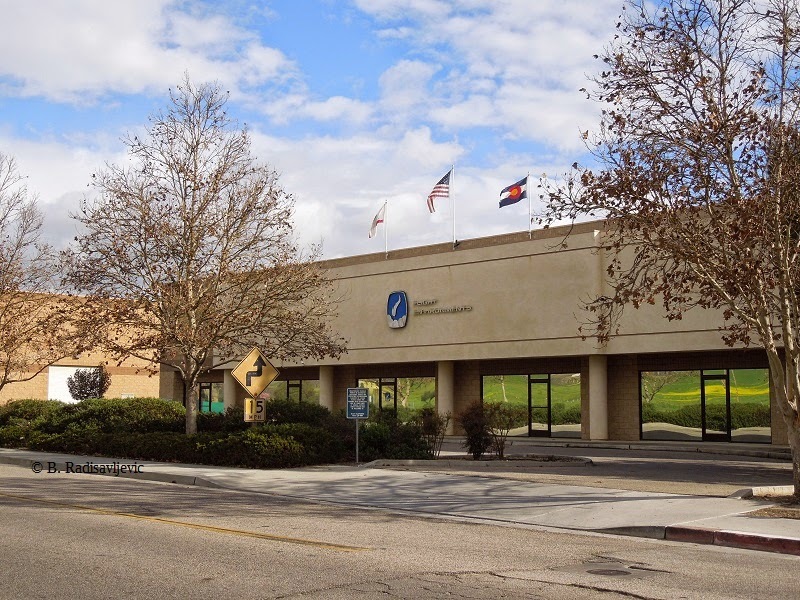 I mentioned yesterday that I'd be attending a meeting of the Board of Supervisors in our county seat, San Luis Obispo, today. It was a long meeting, and after listening to almost four hours of presentations and public comment, it was finally over. 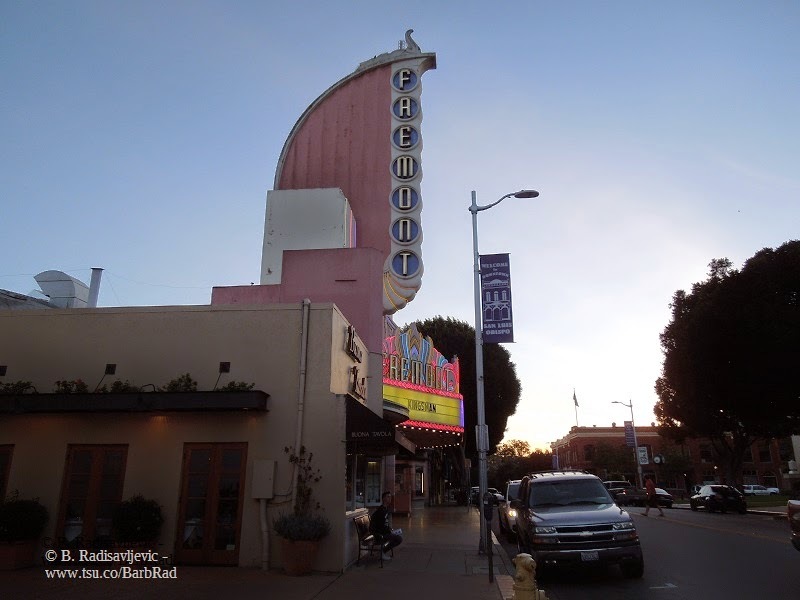 As we walked down Monterey Street to go back to the car at dusk, we passed this historic theater which has served San Luis Obispo for over fifty years. Generations of Cal Poly students are reminded of their college days when they see the Fremont Theater. It probably says "San Luis Obispo" as loudly as the mission itself. I was blessed to walk by just early enough not to need a tripod and just late enough in the day to see the Fremont lit. The sidewalks were also uncrowded, allowing a clear shot. The cars I can't help. They are always there. You can click the photo to enlrge it. One of my other shots of the theater is available as a print at Zazzle, as well as on other products such as phone covers, post and greeting cards, jigsaw puzzles, and more. See all products with this design. Do you remember theaters like this from your childhood or college days? 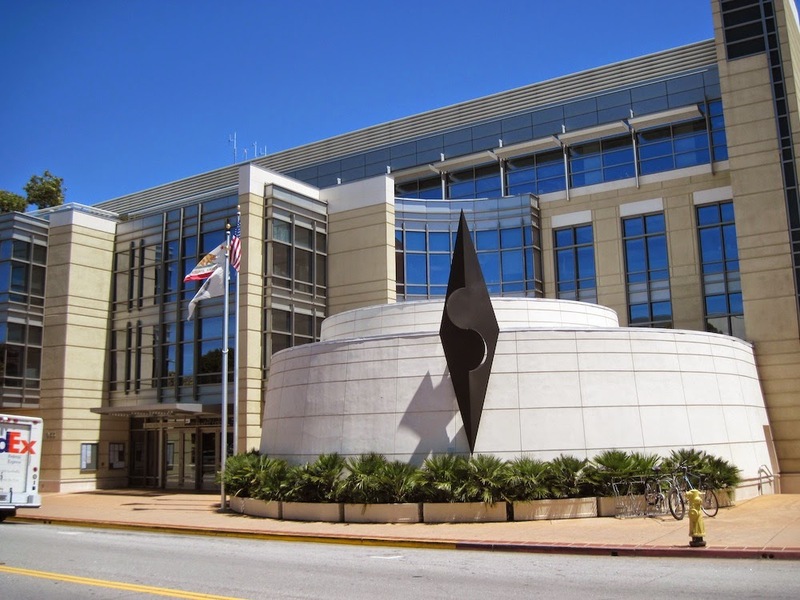 By the time you see this, I will be preparing to leave for an important meeting of the San Luis Obispo County Board of Supervisors at this County Government Center in San Luis Obipso, our county seat. Like most citizens, I would rather not be involved in politics, but sometimes you have to make your voice heard to try to protect your rights. Dirty politics goes on at all levels of government from the city on up to the national level. I have learned that the local level is where one can have the most influence and get to actually know the people who make the decisions. If they are corrupt you can sometimes stop them at the local level before they can move to higher offices. Our country is engaged in a battle as old as California -- water and property rights. One small area at one end of our county has had a few wells go dry. So some county supervisors declared a crisis and tried to use it to make new ordinances that give them control over areas that have no shortage. These are some of the issues that will send me to the meeting February 24. The action will start about 1:30 on these issues. You can read more about them in this article. 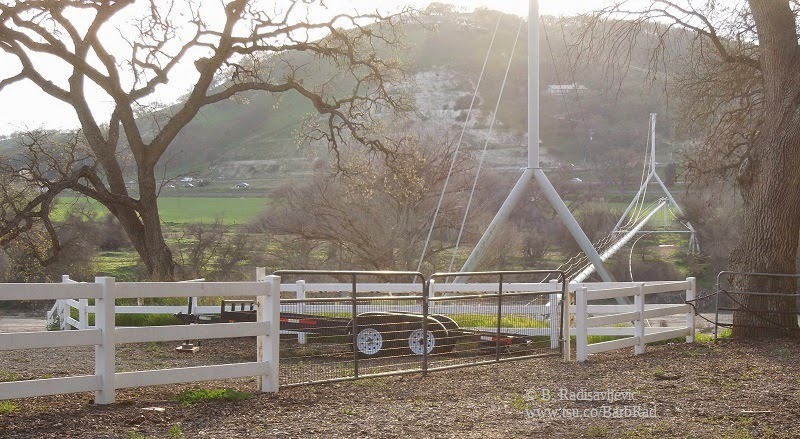 If you own acreage in San Luis Obipso County, please consider attending the meeting if you can. Try to get there about 1:15 PM. I was not in the mood to go for a walk today, but made myself go, even though it appeared it would be raining soon. I had intended to drive out to Sculpterra, a favorite local local winery, so that I could walk around the grounds without ever getting too far from shelter. 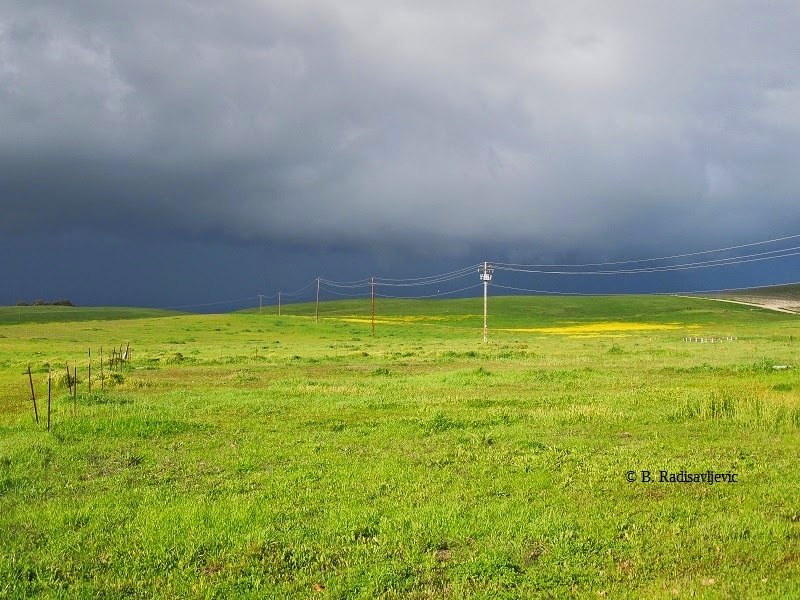 But when I saw the sky over this bright green and yellow landscape, I parked across the street from it in an industrial park and decided to take my photo walk right there. I parked in the lot for Flight Environments, which makes plane interiors. 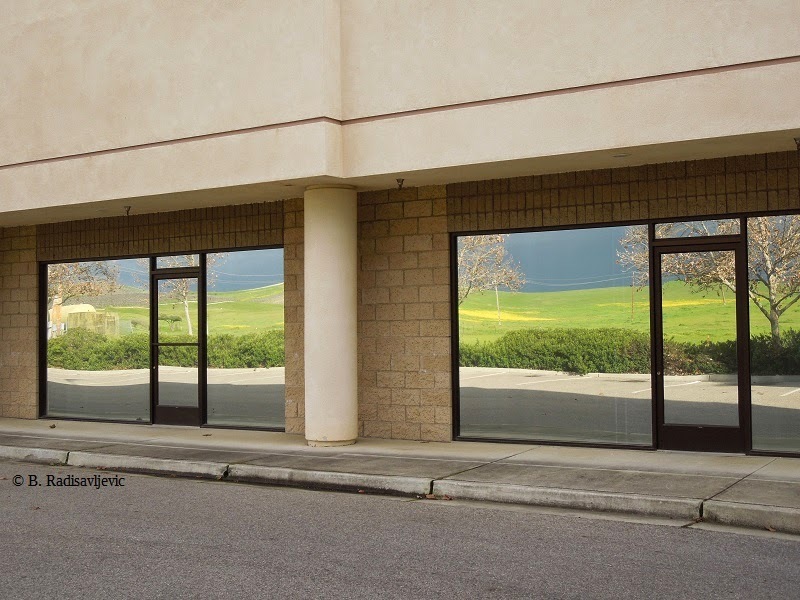 I couldn't help but notice how the mirror windows reflected the landscape from across the road. They were more like picture windows. I'm still trying to figure out what the flag on the right side of the photo represents. The closest I can some is the state flag of Colorado. Perhaps the wind is blowing it so it shows backwards. Here is a photo of the Colorado flag. Below is a closer look at the scenes in two of the windows. I finally got to the end of the block and walked left on a private road leading toward some vineyards on a hill. Along the way were many wildflowers and I spent a lot of time trying to capture the many flying hawks with my camera. The sky was a full as an airport, but I don't have room to show all those photos I took here. As the sky became more ominous, I knew it was time to head back to the car. This was my view as I began to head west again. The hills you see in the distance are on the other side of Highway 101, about a seven minute drive away unless all the lights are red. That's where I found the almond trees blooming last week. As I was almost back to the car, I saw the sun shining through the clouds, and then the drops began to hit me as I was almost to the car. I'm glad I took the walk because I saw so much I wanted to photograph. If it weren't for having my camera with me, I probably wouldn't get out to walk nearly as often. If you enjoyed these photos, please share. The photo below is just right for Pinterest. I shows some of the birds I was able to capture on camera. Have you seen anything beautiful or memorable today? Last time I drove down a certain part of Vineyard Drive in Templeton, a quick glance seemed to indicate the alpacas that used to live there might be back. At the time, I was in a hurry and couldn't stop to take a better look. Today I promised myself I'd go back and get some photos. But instead of alpacas, which I was so sure I'd seen two weeks ago, I found these. Not exactly what I was expecting but I still got out to take some photos. These are two that came toward the fence to check me out. The one on top was something of a clown, I think. 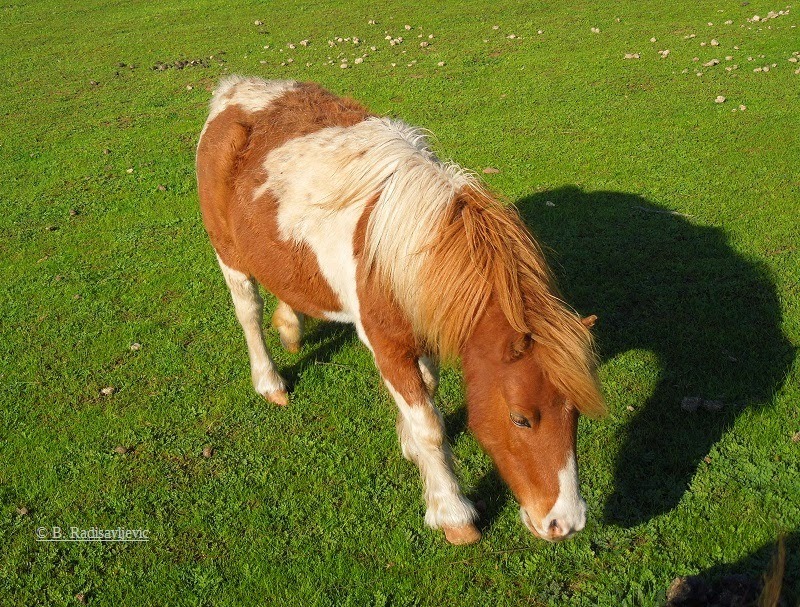 I'm not sure if these are ponies or miniature horses, but I'm leaning toward miniature horses. I hope someone more knowledgeable that I can tell me for sure. Don't forget. You can click to enlarge the photos for a better look. What kinds of livestock do you see near where you live? I learned to love alpacas when some used to live near us in Templeton. After they moved away about a year ago, I missed them. Then last November I was walking through Farmers Market in Paso Robles and found this booth with lots of photos of alpacas, so I had to check it out. 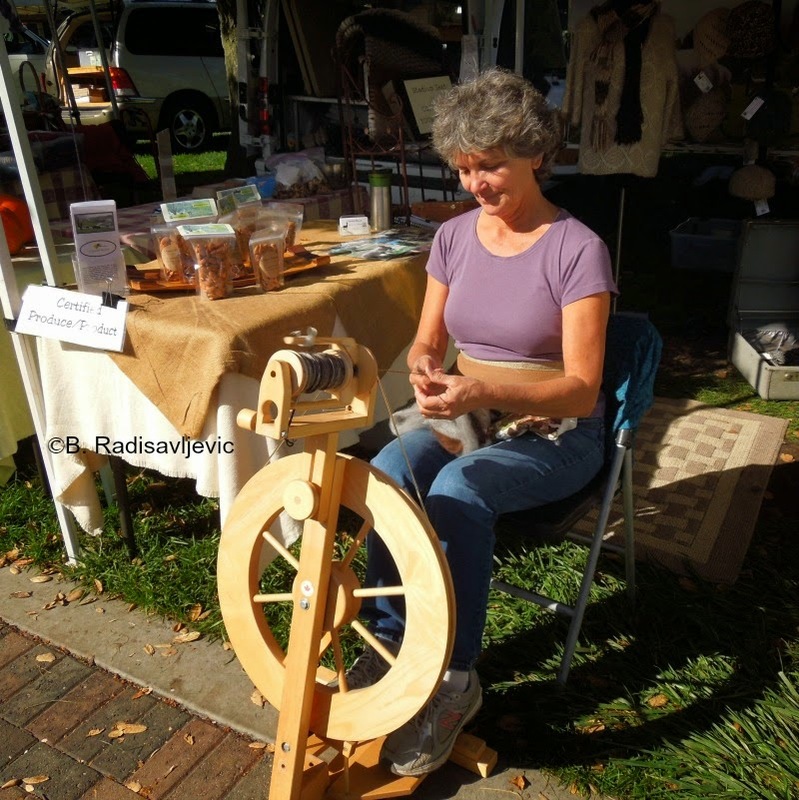 As I looked around I saw some organic almonds for sale and a variety of alpaca yarns in vibrant colors. Some had already been made into hats and scarves. I also spotted a spinning wheel in the booth and persuaded Daphne Capaldi, of the Capaldi Ranch, to demonstrate it for me. She was very gracious and invited me to come see the ranch. 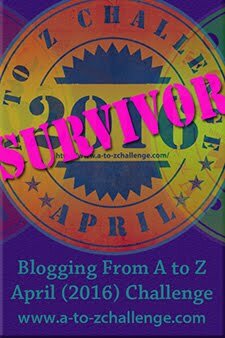 Unfortunately, that had to wait, since I was preparing for major surgery that would keep me homebound until February. I have missed the alpacas that used to be close to us. I have immortalized them in some Zazzle products I made. Here's one of them. 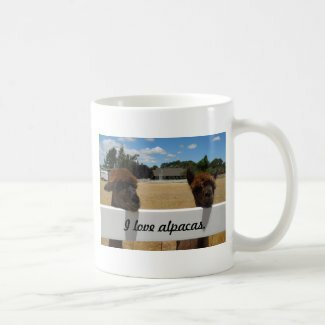 The rest of my alpaca products are available in my Zazzle store. 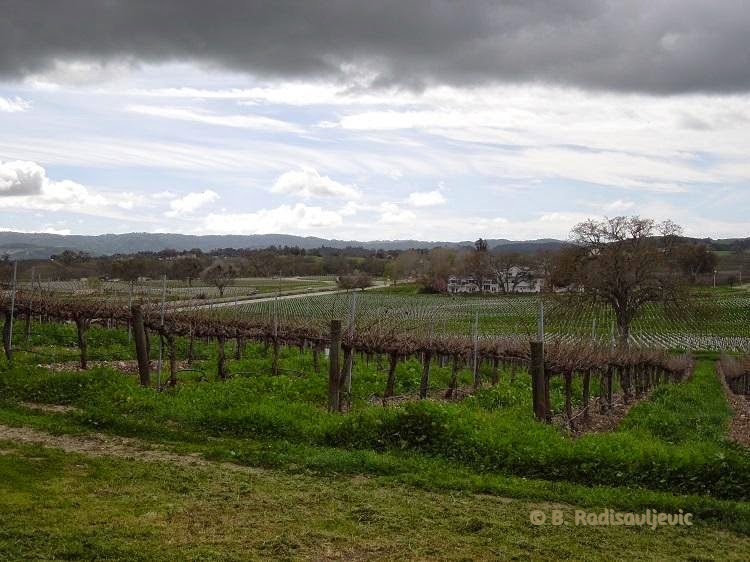 Paso Robles has many vineyards and small farms, often in close proximity. Arbor Road is one of those roads that has both. 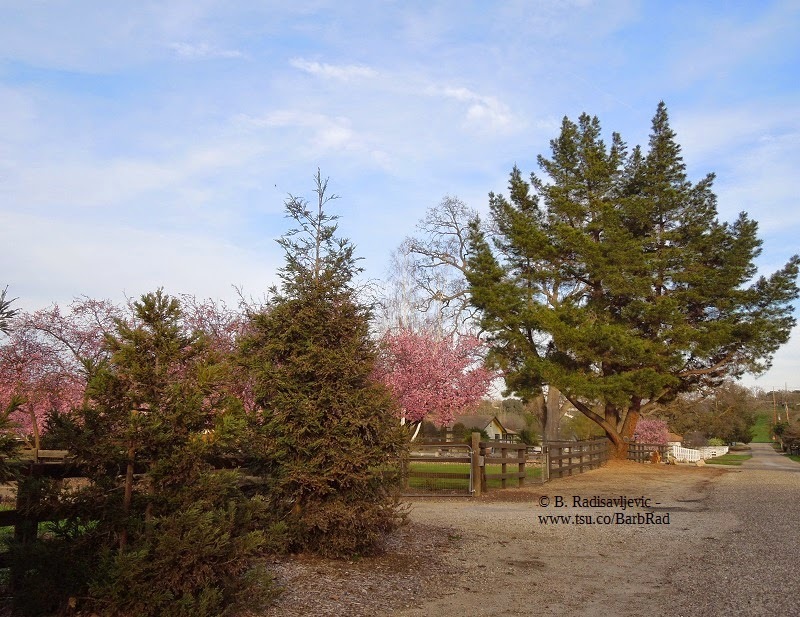 The same day I was following Kiler Canyon Road in quest of blooming almond trees, I also continued on to Arbor Road to get to Templeton. The North end of Kiler Canyon is entered from Vine Street near the Marriott Hotel. After passing the almond trees and some small farms and vineyards, it veers off to the right and continues all the way to Peachy Canyon Road over a long dirt road though an old old forest with some amazing trees to be seen. 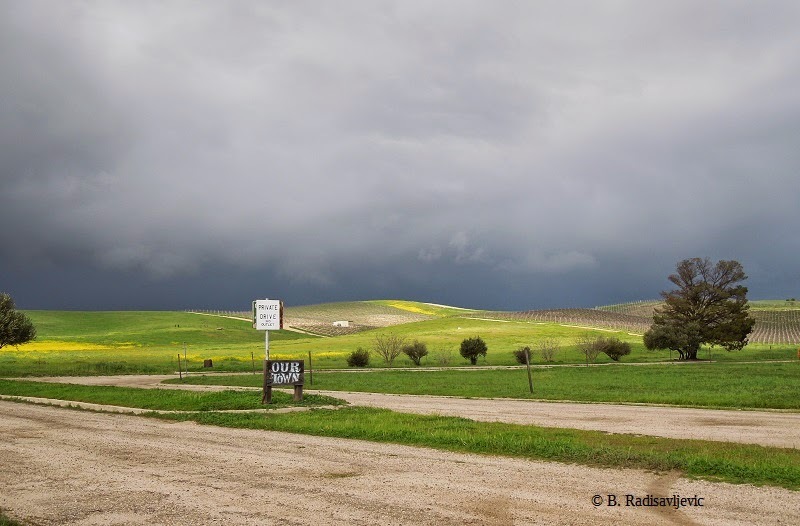 You can see the photos I took on that part of the road in this article: Kiler Canyon Road, A Scenic Drive in Paso Robles. If you turn left at the intersection of Kiler Canyon and Arbor road, you will also find yourself on a dirt road for a while, but it's a smooth dirt road. It was on this road I found the farm that's in this photo. 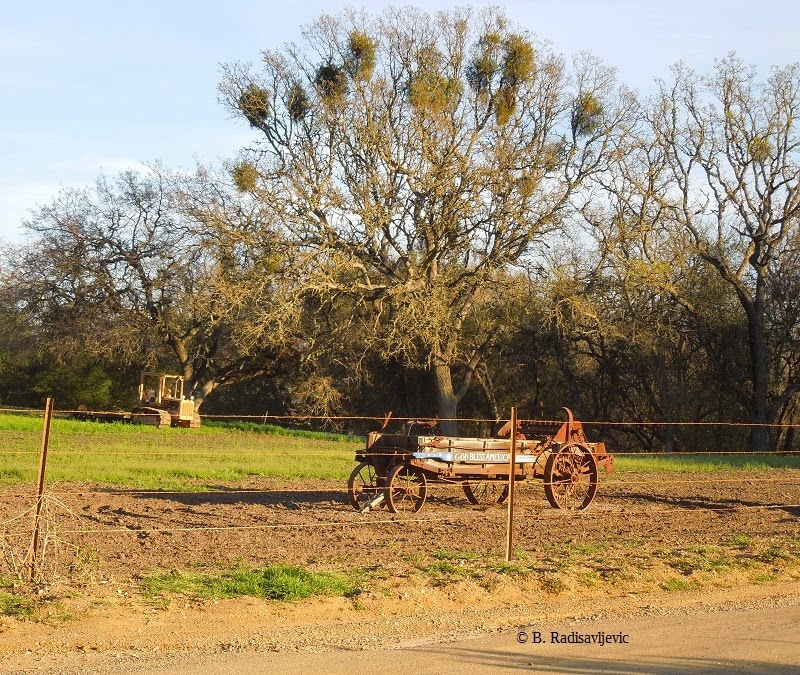 If you click on the photo to enlarge it, you can read the lettering on the old wagon to see how this farmer uses it now to make a statement, or, perhaps, his prayer: "God Bless America." 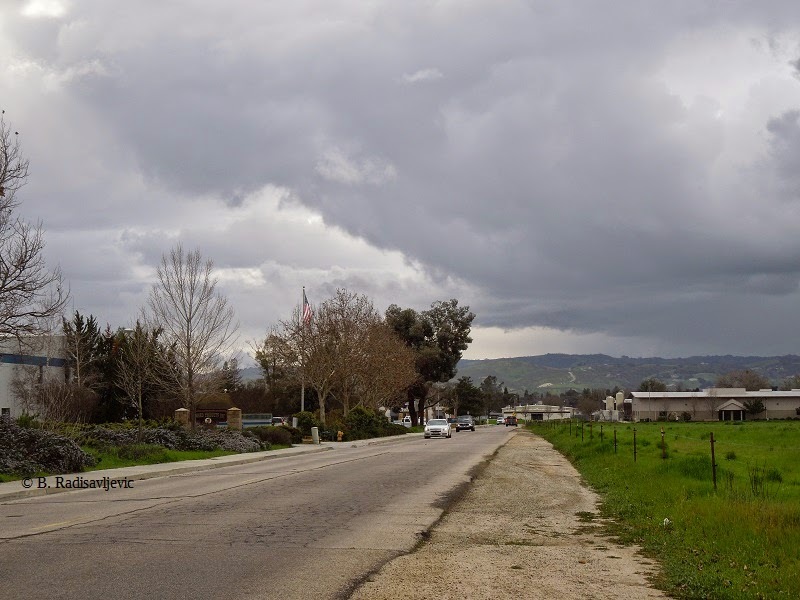 Continue on this road a couple of more minutes and you will come to the paved portion that ends at West Highway 46, the door to the 46 Wine Country beside Summerwood Winery. To go from Vine Street to 46 West will take about twenty minutes -- if you don't stop to take pictures. It's a beautiful drive on a sunny day. If you are ever here, don't miss it. We like to think of our parks as safe places, and, for the most part, they are. But Larry Moore Park is full of poison, especially from February until the end of summer. It's not only poison, but it's lovely poison. You can see it here on the left. I suggest you click to enlarge these photos so you can see the leaves in greater detail. 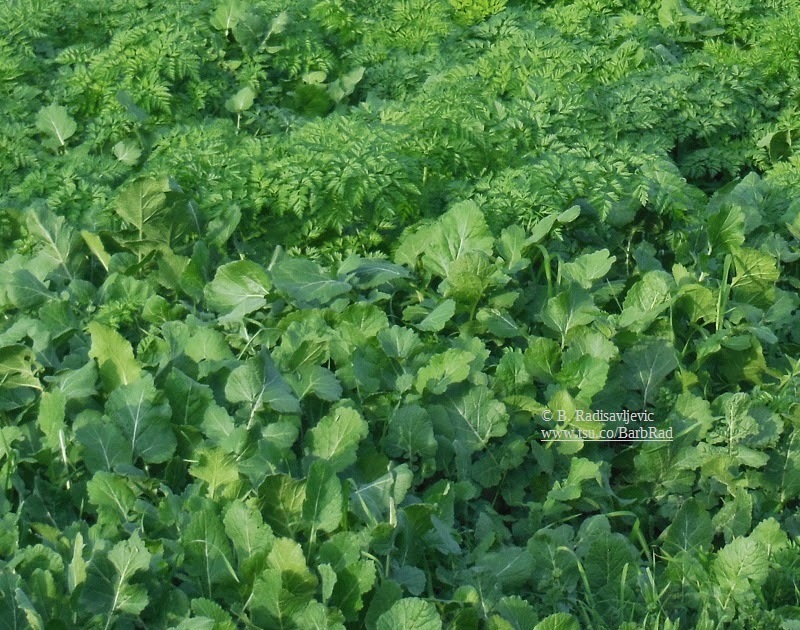 Those beautiful green lacy leaves are none other than poison hemlock, the same stuff that killed Socrates. See my article Poison Hemlock: Lovely but Lethal for information on how to recognize it at every stage of its life. 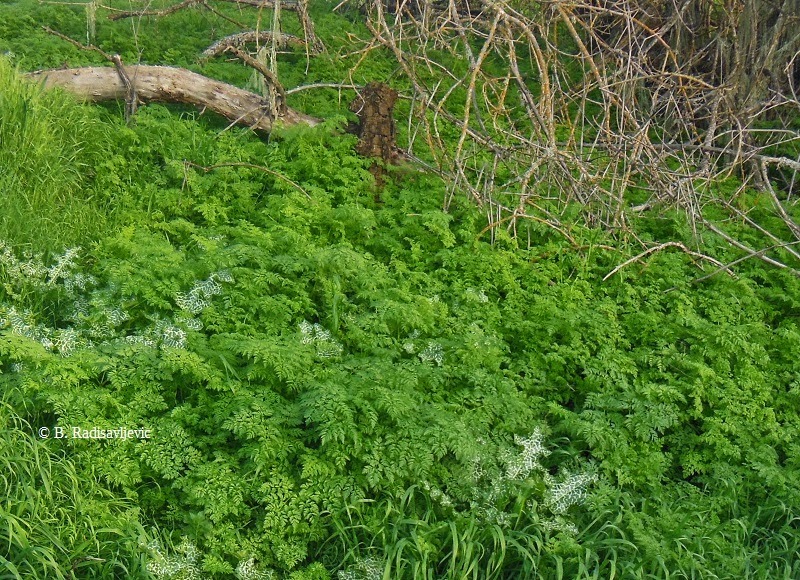 I took the photos in this blog post at Larry Moore Park on February 18, 2015, but the park is full of poison hemlock very year. You will also find it all over the North County on uncultivated land and on roadsides, and probably in your yard if you have open space. It smells sinister if you pick it, but you really don't even want to touch it. One mouthful of this plant can kill an adult, but it comes with no warning labels except its smell, and even that is subtle. Poison hemlock often grows in close proximity to milk thistle, another beautiful plant, but it won't harm you unless you touch its thorns. Wild mustard often grows with one or both of these. You can see the broad white-streaked milk thistle leaves interspersed among the hemlock plants in this photo. If you see a fern-like bright green plant growing next to mustard and / or milk thistle, it is very likely to be poison hemlock. Teach your children to recognize these plants. Mustard and milk thistle are harmless, but they can warn you that poison hemlock may be nearby. 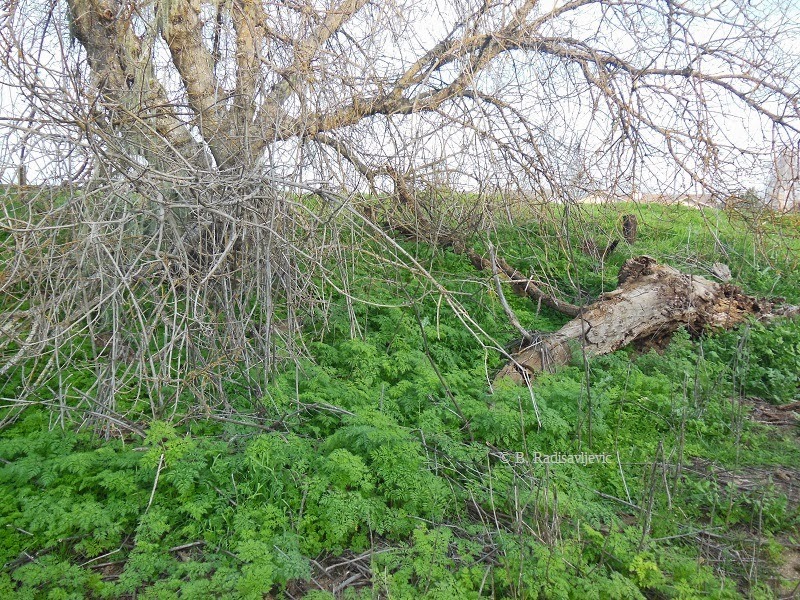 If your children play at Larry Moore Park between back trail and the riverbed, be sure they are warned never to touch the green plants or eat them. Poison hemlock can resemble wild celery, Queen Anne's Lace, and even wild carrot. They are in the same family. 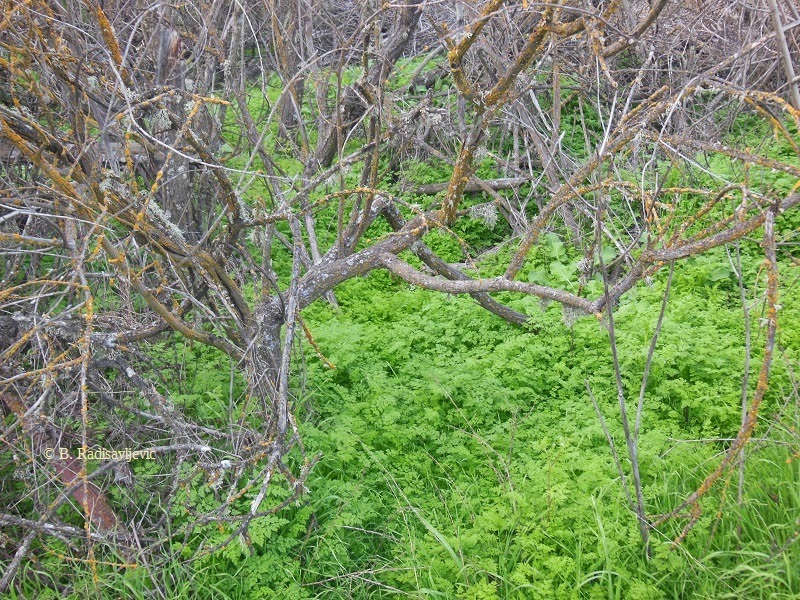 This last photo shows you just how much poison hemlock invades the park. I was walking that back trail that leads to river access when I took these pictures. The poison hemlock grows not only along the trail, but through all the dead and living trees almost to where the river sand starts. It's a see of green invading the woods - just where children might be playing hide and seek. Look through the trees and you will see it everywhere. This is the season here when trees are flowering. You have already seen the almond trees in bloom, but the almond is only one of the many that are flowering here now. There is also this gorgeous tree with deep pink flowers. These trees are so fragrant I could smell them from several feet away, and it was a very sweet fragrance. I happened to see a woman working in a yard where one of these trees was blooming, so I asked her what it was. She didn't really know, but she said it did not really produce edible fruit, but a small inedible cherry-like fruit. I will have to go back next month and see what it does produce. I suspect this is an ornamental plum. If the leaves turn out to be purplish when they appear, I will be sure. The other trees are evergreens. I believe they are mostly pines. This neighborhood on Oak Lane is full of beautiful trees. Those who have walked facing south in the bed of the dry Salinas River have probably seen this pipeline bridge that begins on the end of Oak Lane. 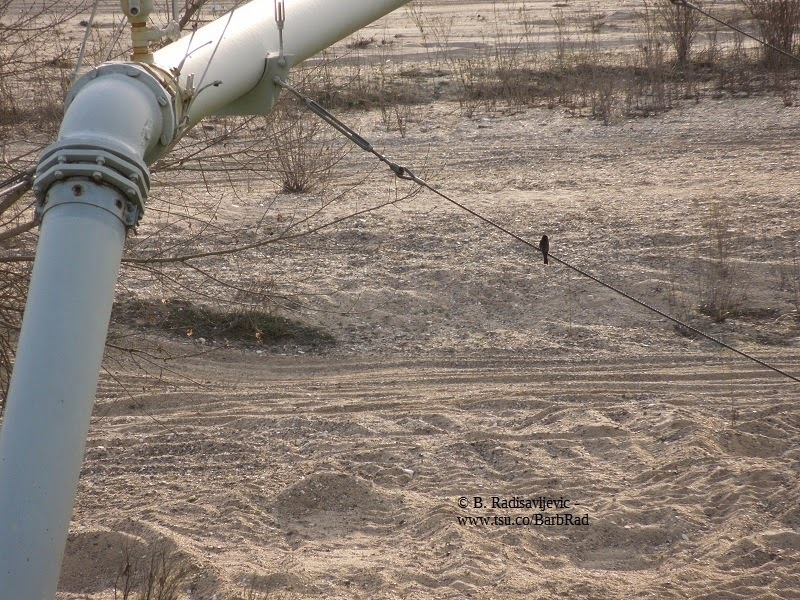 I happened to catch this bird perched on a cable that was helping to anchor the bridge. (You can click this or any of these photos to enlarge them.) 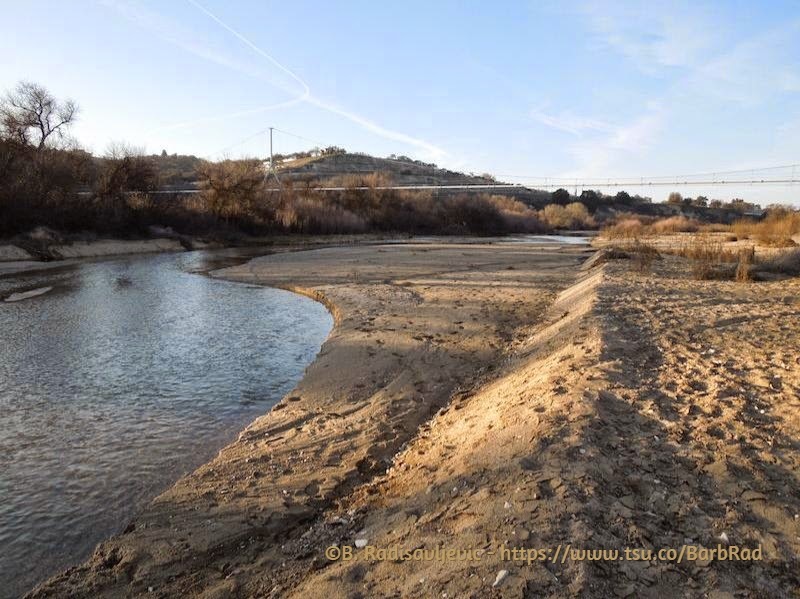 As you can see, the river under the bridge is dry here, since we haven't had enough rain to fill the river this year yet. This photo shows you how this bridge is anchored from this end. It was taken at the end of Oak Lane, looking across the river from the east to the west, on Sunday, the same day I took the picture above this. Here is the bridge as one walks toward it in the riverbed. 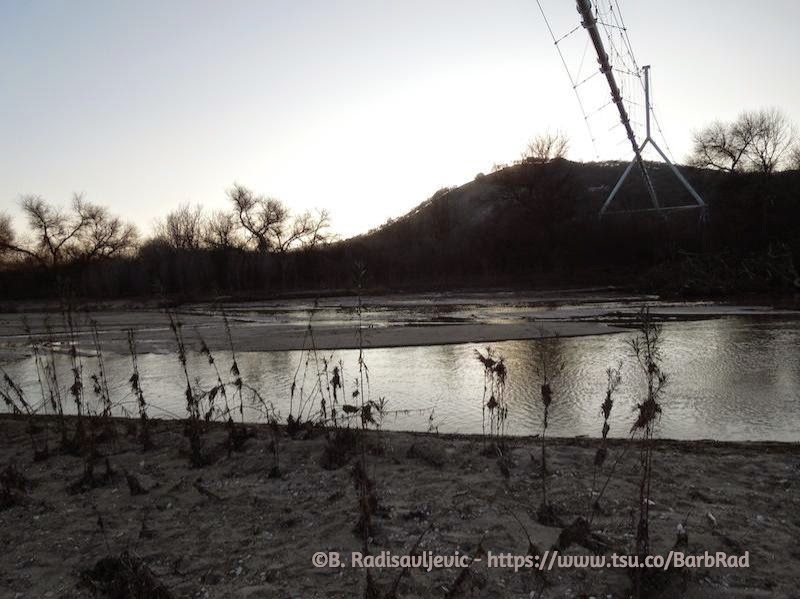 This was taken in January, 2013, when there was water in the river. Don't forget to click to enlarge these photos. For a totally different perspective, this was shot from underneath the bridge as I was walking in the riverbed that same day in 2013. Does your city have a river running through it? What sort of bridges to you have crossing it? 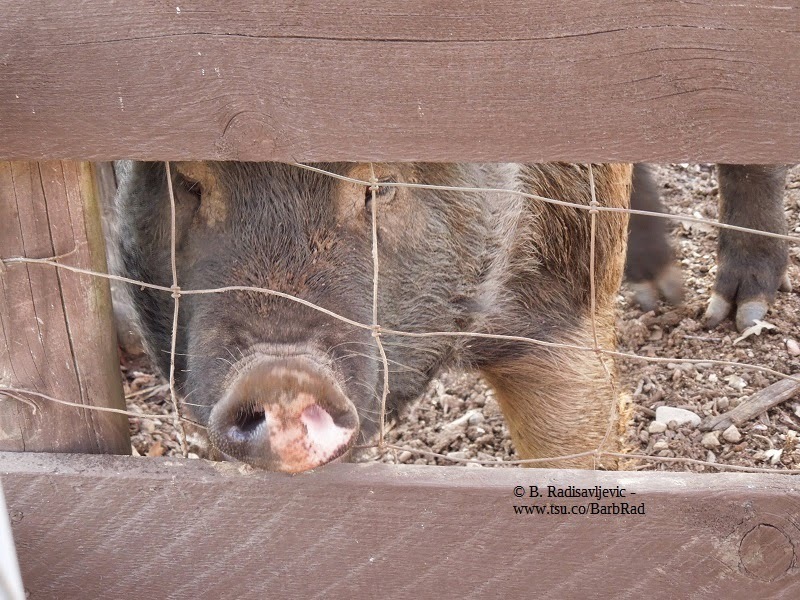 Today I went back to see the pig on Oak Lane and get some better photos. She was in the mood to pose today, so I thought you might like to see her. 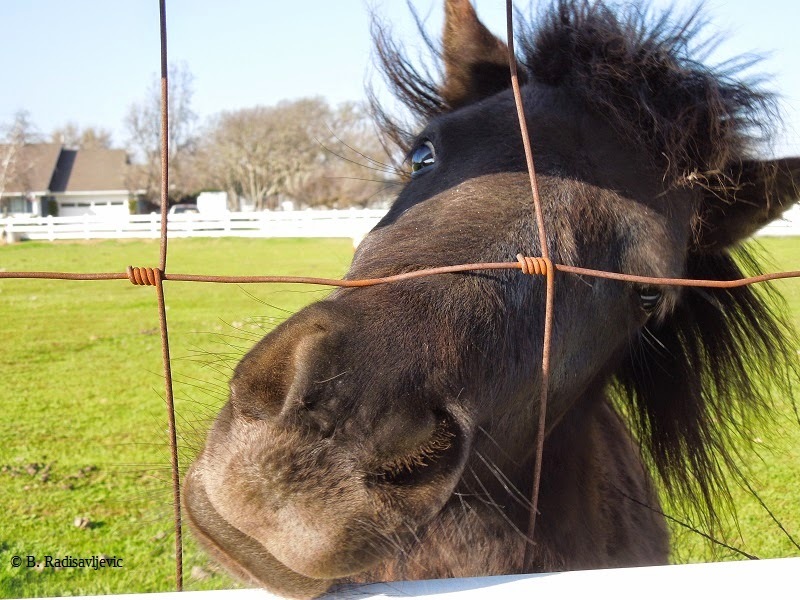 Even though she appeared to be somewhat afraid of me and at first ran when I approached the fence, she finally got curious enough to come take a closer look at this human creature pointing a camera at her. I had to be very patient and quiet to keep her from running away again. 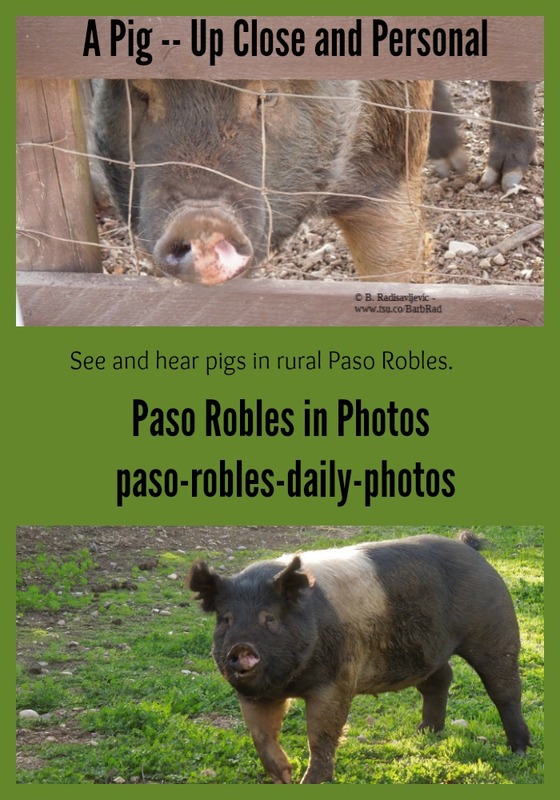 Just to let you know what these pigs sound like, I made a video on one visit to them. Here it is. 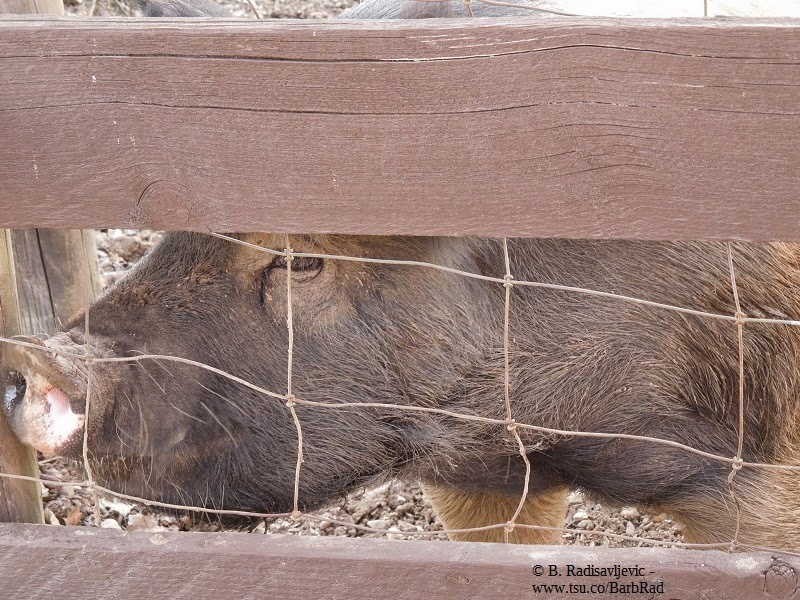 This pig decided to push her snout right through the fence, as you see below. I decided she couldn't top that, so I moved on down the road to see what else I could find. Stay tuned. 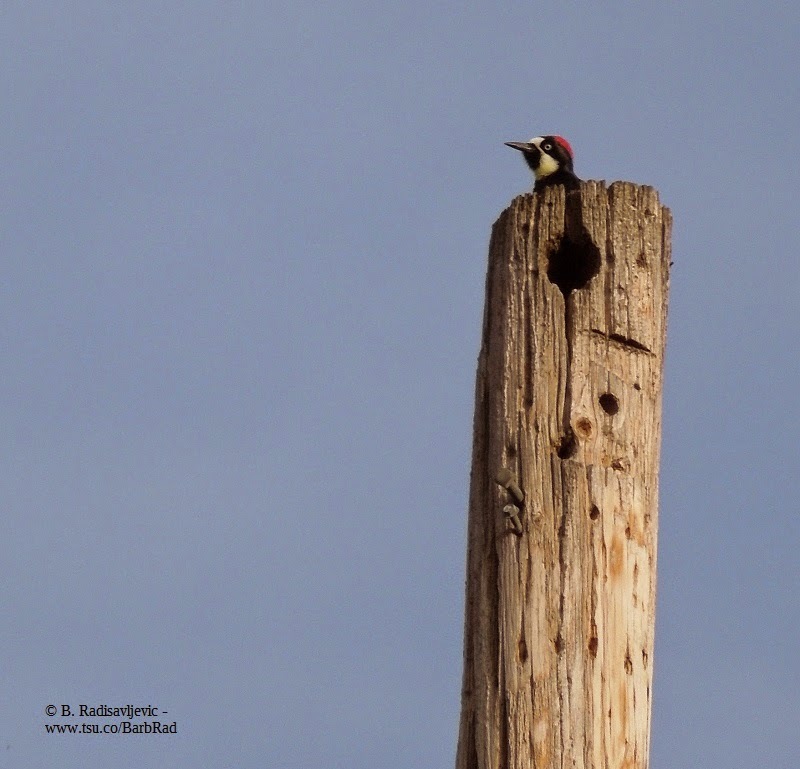 If you think others might enjoy these photos, why not share this post? There are sharing buttons below. The image below was designed to share on Pinterest. 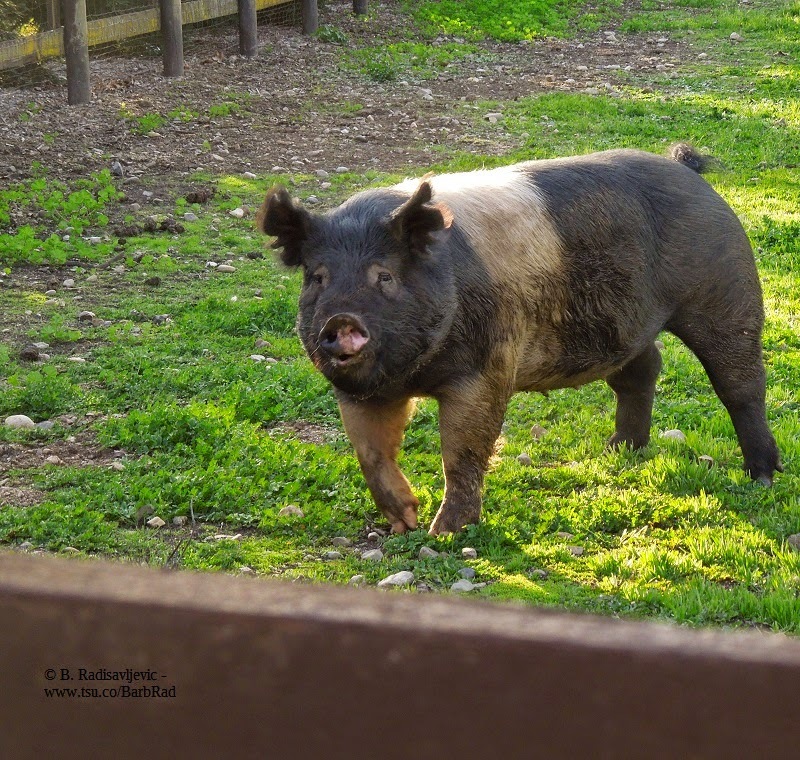 Have you raised or had any experiences with pigs? Why not comment on it below so we can all enjoy what you have to say?